Significantly shorter loading times for loading cargo from the sides and increased loading height for the rear gantry – these two strong arguments speak for the new, uncoupled gantry beam for swap flatbeds, introduced by Krone for the first time at the IAA. The innovative gantry beam now enables automated lifting of the 2nd roof beam to increase the rear door height. The roof can be raised without opening the rear gantry. The new gantry beam consists of two assemblies (gantry beam/hood), which can be moved independently when using the raising roof. The gantry beam is bolted with a round steel bar, which in turn is guided in slide bearings. In addition, the round steel bar is bolted onto a gas pressure spring, which in turn is connected to the rear post. By uncoupling the gantry beam from the roof, the canopy can be raised and lowered independently from the rear end. Another benefit: Also when loading from the side of the unit, the rear does not need to be opened. If the rear end should be opened, the gantry beam is also automatically raised using the gas springs when raising the roof. This increases the loading height at the rear. When lowering the roof, the gantry beam is moved back into the basic position by the overlapping hood and the weight of the roof. In the previous version, the raising roof could only be used when the rear gantry was open. When the rear end is open and the raising roof is operated at the same time, the loading height in the rear gantry inevitably has to increase. By uncoupling the gantry beam from the roof, the canopy can be raised and lowered independently from the rear end. 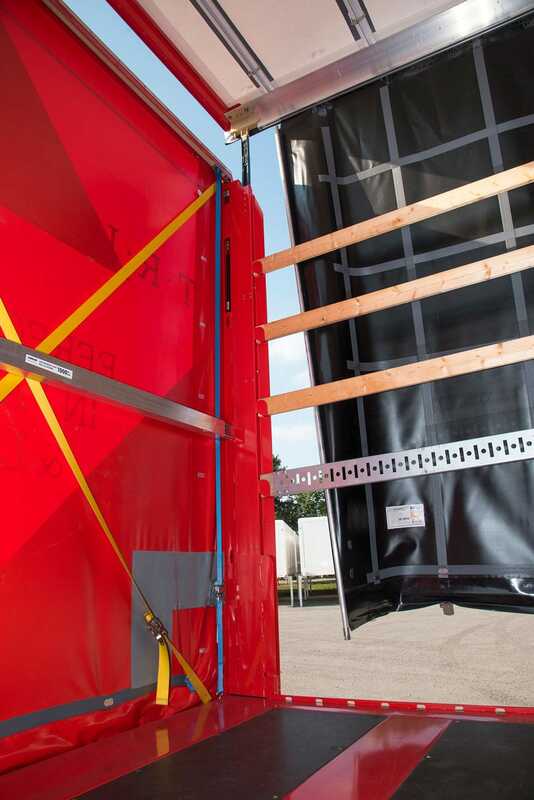 For the user, the innovation represents significantly shorter loading times when loading from the side as well as an increase in the loading height in the rear gantry. The system is only intended for swap flatbeds.